Big Ideas and Exciting Discoveries! School Council was reduced in number today due to the Year 6 Residential and the Year 3 trip to the Ashmolean Museum, but this didn't dampen the enthusiasm towards researching different ideas for our Nature Area. Miguel and Ella discovered that bees are particularly attracted to purple flowers, and made a list of different ones we might plant as well as some herbs that attract bees, and smell nice too! Broden and Layton researched what we would need to build a pond, and told us that it would be possible to have a little waterfall which could be solar-powered. Benjamin and Lylah found out lots of useful information about feeding birds, helping them nest, and how we could create a wildflower meadow. 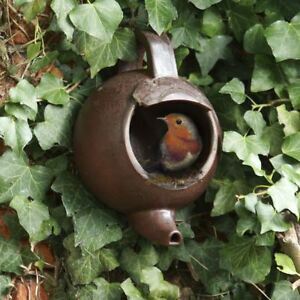 Did you know that robins might like to live in your old kettle or teapot?